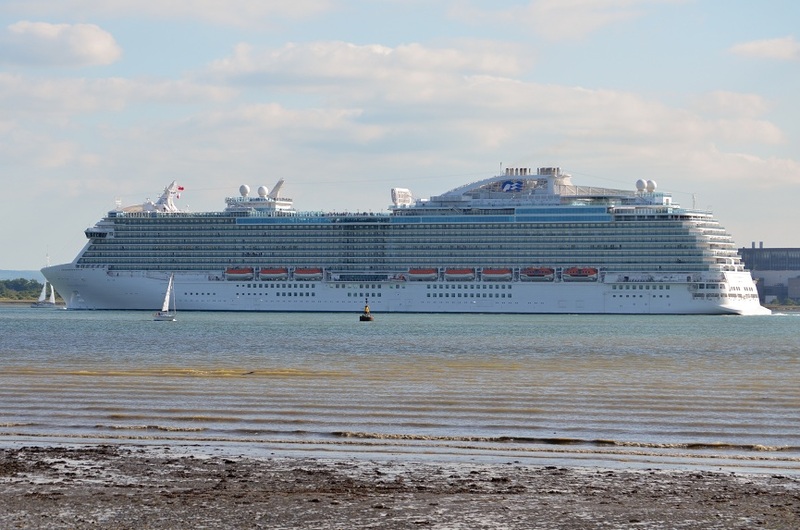 For day 2 of our Royal Princess preview cruise, we were scheduled to be anchored off Guernsey. The weather forecast hadn’t been good with high winds and rough seas predicted. Sure enough, when I peered through the curtains in the morning the island was disappearing off our starboard side. An announcement had been made apparently at 07:15, but we missed it as we were still asleep! Another announcement was made later on confirming we were having an unscheduled day at sea. It mattered not, we hadn’t planned on getting off anyway as we wanted to experience all the ship had to offer. Instead of what would have been a wet, windy, cold day anchored off St Peter’s Port, the Captain headed back across the Channel and found us some much nicer weather for what turned out to be a very pleasant sea day. The last minute change in itinerary meant they had to print a new schedule for the day and put on a few extra events. That was fine, but some of the events happened before they managed to get the schedule out and some things in it were still wrong! It was good that they tried though and had a contingency plan in place. We had hoped that everyone would have got off at Guernsey leaving us to explore an empty ship, so we were a little concerned that the revised plan would mean it was going to be busy everywhere. In fact it wasn’t bad at all. 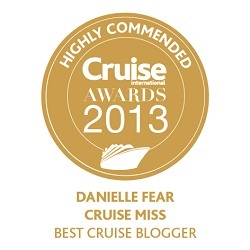 I think this was partly due to the size and layout of the ship, as well as it not being fully booked. 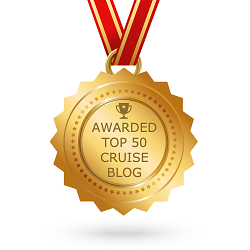 We explored every inch of the ship as planned, had a relaxed lunch in the Horizon Court, found a sheltered spot for a bit of sunbathing and even squeezed in a quick quiz before dinner. Entertainment on board was the usual mix of comedians, cabaret and tribute acts. 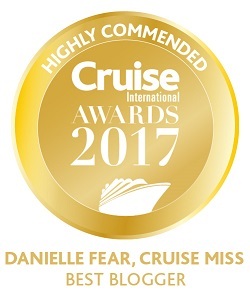 We enjoyed them all and knew two of the acts from previous cruises – the excellent ventriloquist Paul Zerdin and the talented and funny piano act Kory Simon. The Abba tribute “Arrival” were the headliners in the theatre on the second night and they too were very good. The entertainment venues themselves were impressive spaces. The theatre was big, open and, with there being no pillars, had fantastic views wherever you sat. Contrary to its name, the Vista Lounge has no views but is a large show lounge at the aft of the ship. It is stylish and has a good layout with most seats directly facing the ample sized stage. Bar service was on the slow side and some staff did seem to be struggling to keep up with the orders. 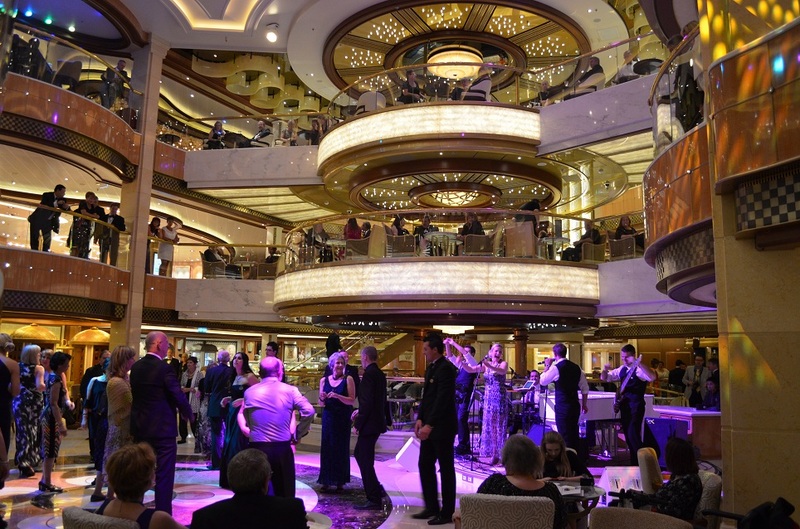 One of the standout features of the ship is without doubt the stunning central atrium or Piazza. It is designed to be the hub of the ship with many bars and eateries spreading out from it on every level. Elegant and exuberant it is a busy place but has a real buzz to it. If you like people watching or relaxing in a bar taking in the sophisticated atmosphere, it is THE place to be. It can be a bit chaotic at times though and one thing we found was that there was only ever one band or musician playing in any one bar at a time, due to the open layout. Another highlight was the dancing fountains. 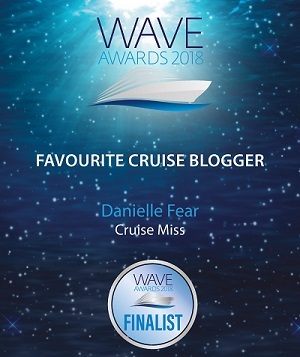 Occupying the large platform in the middle of the pool deck that also doubles as a dance floor for sail away parties, they are quite an unusual feature. The show itself was set to music with video effects playing on the big screen. 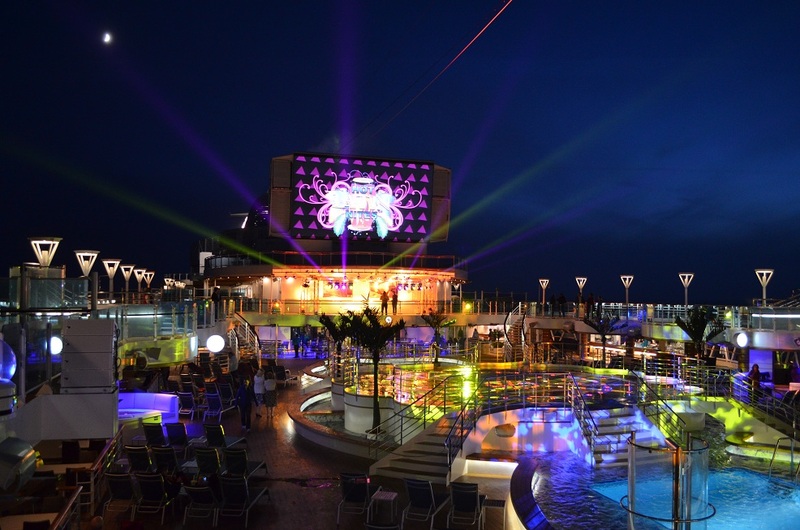 The pool deck was engulfed in multi-coloured beams of light too and it was a very entertaining spectacle. Movies Under The Stars was also great. If the weather had been better I may have made it to the end of Skyfall, but just after midnight I gave up and retired gracefully. 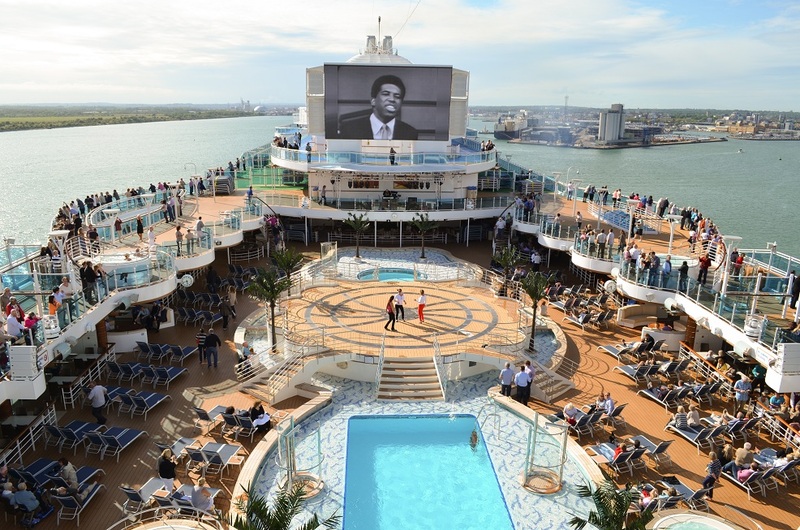 The screen is the biggest one at sea and the sound system is awesome. They usually put out lovely thick red cushions with pillows for the movie, but someone forgot and despite asking several members of staff and ringing reception, the cushions never appeared. They did however have the blankets, hot milk, cookies and popcorn which were most welcome and ensured that I ended the cruise with a completely bloated stomach and a vow to start the diet the second I stepped ashore! On such a short cruise it was difficult to try absolutely everything and we didn’t get chance to go to Celebrity Live or any specialty restaurants. The biggest omission, however, was Alfredos. How I could miss an authentic Italian pizzeria is beyond me, especially as it was complimentary! Apparently it was very good though. 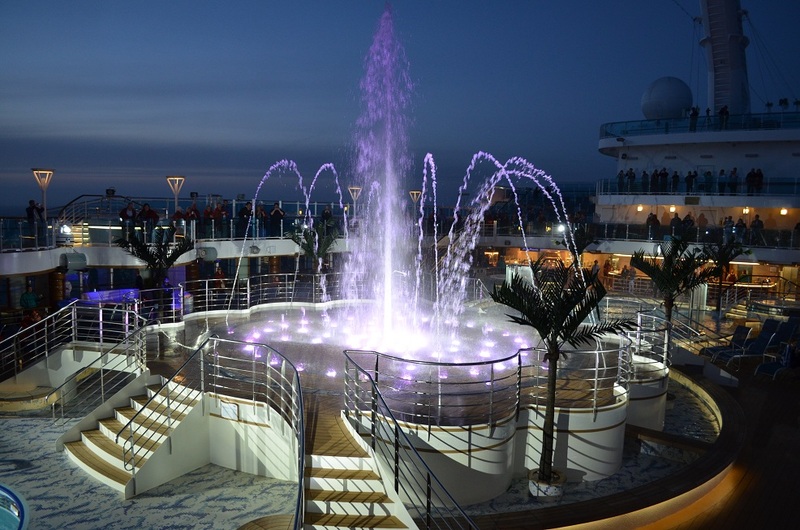 Overall there was plenty to like about Royal Princess; Horizon Court, the theatre, Vista Lounge, pool deck, Movies Under The Stars and the Piazza. Unfortunately there were also a few things that I didn’t like so much. 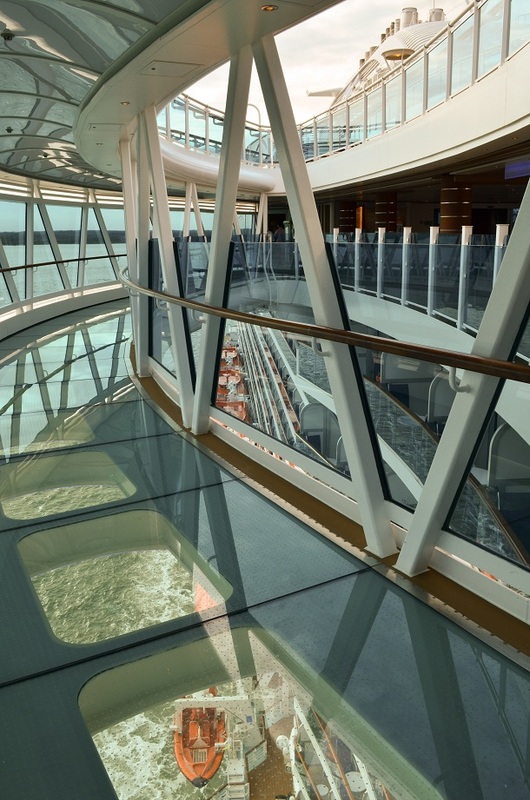 My biggest gripe is that there were no bars or lounges with good sea views (like say Metropolis on P&O’s Ventura, the Sky Observation Lounge on Celebrity Solstice classes, or the Viking Crown Lounges on RCI ships). Also, despite what the deck plans show, there is no promenade deck. There are a couple of nice gantries midship and at the aft end but that’s it. Our friends unfortunately had a bad experience with their cabin falling apart in the night necessitating several bleary eyed trips to reception and a couple of visits to the cabin by the ships joiner. As a result they’d had an unhappy and sleepless night. This led to them describing the ship as being a bit like an Alfa Romeo; looks beautiful but has a slightly dodgy build quality! Others apparently had similar issues, but hopefully such problems will soon be fixed. There were minor staff issues and organisational problems too, but these will be overcome quickly as the crew become more familiar with their new ship. For the first of class Royal Princess is a fine ship, but there could definitely be some improvements for subsequent builds. It will be interesting to see what the P&O flavour of this class will be like when it arrives in a couple of years and also if anything has changed on the next incarnation; Regal Princess.